Very recently it was decided at the 32nd GST Council meeting, to put in place the all-new GST Composition Scheme for services and mixed supplies, from 1st of April 2019. This new composition scheme is for all those suppliers who are having GST registration, having annual turnover not more than ₹50 lacs. Very importantly, a low GST rate of 6% shall be chargeable on such taxpayers. The Central Board of Indirect Taxes and Customs (CBIC) have now clarified that each one of those who have a GST registration under this new Composition scheme shall issue a bill of supply. They no longer have to raise a GST invoice as of now. #1. How will be the new Composition Scheme under GST? The threshold for GST Registration would be kept at ₹50 lacs. The GST rate shall now be 6%, without accessibility of Input Credit. Furthermore, the taxpayers having GST registration under this scheme would require just annual GST return filing procedure in FORM GSTR-9A. They would not have to file quarterly return GSTR-4. This new composition scheme under GST will become finally effective from April 1, 2019. #2. What has CBIC notified for the composition taxpayers? The CBIC had issued Removal of Difficulty Order on March 8, 2019. Under this, the CBIC has clarified that all persons who have GST registration under the composition scheme will currently issue Bill of Supply instead of a GST Invoice. This is accordance with the Section 31(3)(c) of the CGST Act 2017. This section prescribes issuance of a bill of supply instead of tax invoice by composition dealers. 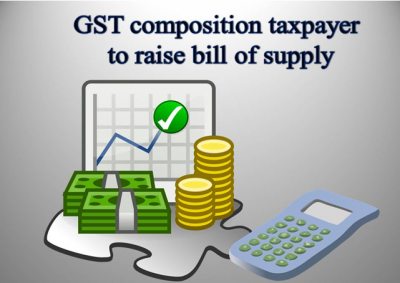 Henceforth, all the composition dealers will presently issue bill of supply rather than a GST invoice. #3. What is the reason behind composition taxpayers not requiring a GST invoice? Taxpayer having GST registration under Composition scheme are not allowed to charge GST on the invoice from their customer. Also, taxpayer under the Composition scheme has to enter the amount in the Invoice that is inclusive of all taxes. Composition dealers are not allowed to shift the input tax credit to their customers. Besides, the composition dealers are not allowed to take the Input Credit. Taking note of the above regulations, the composition dealers now are not allowed to raise a GST invoice. However, they can still raise a Bill of supply or a normal invoice to the customers. #4. What other Changes are made in the Composition Scheme? It now raised the threshold limit for Turnover for the present Composition Scheme. Now The maximum value for Annual Turnover in the previous year for availing the GST registration Composition Scheme shall now be increased to ₹1.5 crore. However, the Special category States would now have to make a decision about the Composition Threshold Limit very shortly.